Near the city but also in far areas both in the north and in the south of the island, there are castles, ancient ruins, villas, towers and fortresses that highlight the past and the history of Corfù. The area of historical, religious and cultural interest par excellence is the Paleopoli that is well described in the Top 10. The monument of Menecrates is situated to the south of the old town, in the homonymous road near the police station of Garitsa, where in the past there was the cemetery. This monument was uncovered in 1843 but dates back to 600 B.C. and it commemorates the death of Menecrates, who is not buried inside because his body is lost at sea. 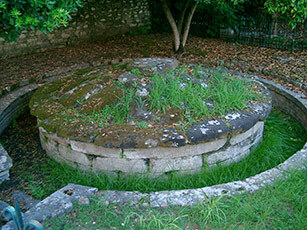 It is circular and has in top an epigraph, in an archaic writing, asserting that the grave belongs to Menecrates, ambassador of Corfù and citizen of Ianthia. 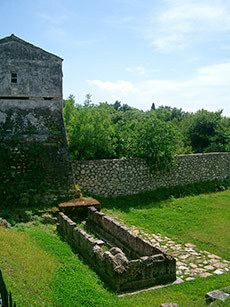 Just in front of the entrance of Paleopoli there are the ruins of the Early Christian Basilica of Saint Kerkyra. This structure of remarkable dimensions, that today rises in a green field, certainly goes not unnoticed. It was built before the 450 A.C. with materials of ancient constructions and over the years it was destroyed by many invasions (Goths, Saracens, Normans, Turks…) and wars. The basilica was rebuilt two times till the final undoing happened during the bombardments of the Second World war. Today only parts of the apse and of the external walls remain, while you can see parts of the paving in the Byzantine Museum. Also these ruins are situated in the area near the Paleopoli to south of the old town. Today, very little remains of the temple dedicated to Artemis, only parts of the base; there are none of the numerous columns that were once a characteristic feature. It was built in 590 B.C. with 17 columns in length and 8 in width and it was very big considering the largeness of the altar and the western pediment that has been discovered and now kept in the Archaeological Museum. This pediment is 17 meters large and approximately 3 meters high and it represents the Gorgon in the middle, her sons Pegasus and Chrysaor and two panthers to the sides and the battle of Titans to the double ends. The temple was discovered by French in 1812 during the fortification works that have brought to light also parts of the ancient aqueduct. The Nerantzika Tower is the only part of the old walls of Corfu Town that is still present. In this area, in antiquity, there was a port called Alcinoo the entrance to which was bounded by two towers from which point the city walls began. During the invasions and the wars the walls were destroyed and this section of the walls, today called tower of Nerantzika, has been saved because built into the Byzantine chapel of the Virgin Mary. 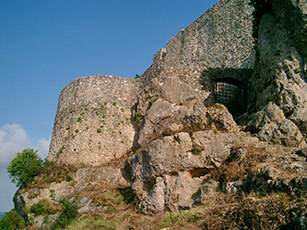 Anghelokastro is the name of the Byzantine castle located further north than Paleokastritsa, on the way to Aghios Georgios. It is perched on the hilltop that is surrounded by the sea on three sides. You can reach it passing through the village of Krini and continuing by foot till the summit. The panorama from the castle is wonderful and when the sky is clear it is possible to see also the chief town. In the past the castle had been chosen as a lookout for pirates and as the perfect place from which to protect the town from enemy attacks, as happened in 1571 when the Turks led an unsuccessful assault on it. It was realized in the XIII century and its construction was ordered by Michael II, the despot of Epirus, who also called it "Michelangelo Castle". Inside there are a cove with the altar of Saint Domenica, a small church of the Michael and Gabriel Archangels and a cell of an hermit. It is opened every day from 8:30 till 15:00. 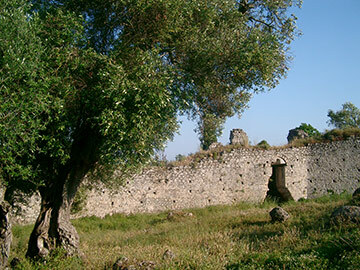 The Gardiki fortress is situated in the south of Corfu island and to be precise near Aghios Mattheos village. A. Mattheos is a not tourist and medium-size town that rises on a hill further north than Korission lake. Just in the area between Ag. Mattheos and the lake there are various narrow roads that lead to the sea passing through forests of very high olive trees. Following the signs you will find the rests of the Byzantine Fortress which was constructed in the XIII century by the despot Michael II, the same who ordered the construction of the Anghelokastro near Paleokastritsa. Little remains of the ancient fortress, only parts of the tower and of the external walls. Originally the fortress was octagonal-shaped with a great tower for every corner and entering you can notice that the walls were realized with materials taken from ancient constructions. Entering on the right there are the rests of the ancient chapel of the fortress. 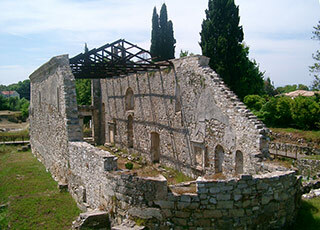 The castle of Kassiopi lies in the homonymous town that is in the north east of Corfu island. It was constructed by Roman and later improved by Angevin; it is on the top of the small cape separating the two beaches which in the past were the two ports of Kassiopi. At the time of the occupation by Venice, the inhabitants of Kassiopi resisted the arrival of the Venetians and fought them from the castle, keeping them at bay for a long period of time. When they finally capitulated, they destroyed the castle so that it would not fall into the hands of the enemy. In this way the city remained unprotected and the inhabitants sought refuge in the villages situated on the Pantokratoras mount. Today only the external walls and the entrance remain of that castle which was partially reconstructed by Venetians. Inside there is a wild garden full of olive trees and there is a path that allows you to walk along the walls, looking out to see the view.